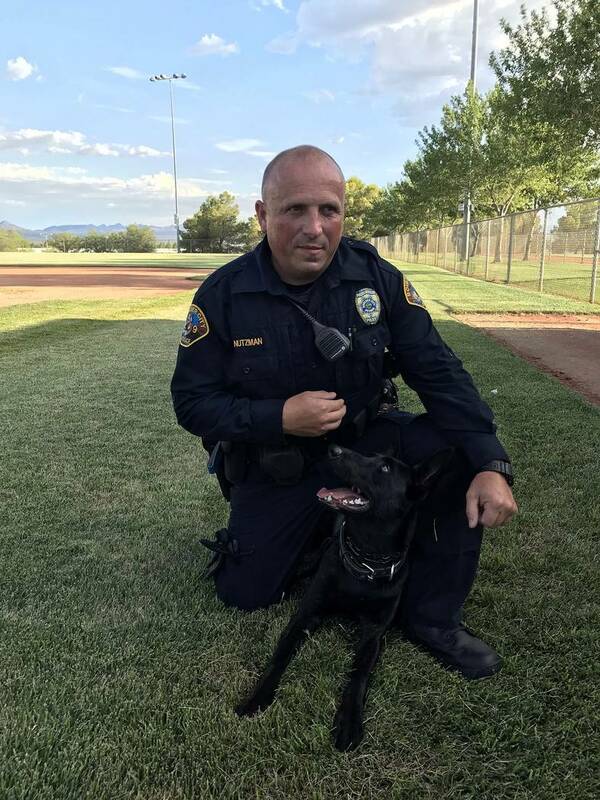 Boulder City Police Department has added a new K-9 officer. Hali Bernstein Saylor/Boulder City Review Boulder City Police officer Alan Nutzman puts his new K-9 partner Luna, a Dutch shepherd, into the guard position. She made her official debut during National Night Out festivities on Tuesday in Veterans' Memorial Park. Luna, an 18-month-old Dutch shepherd that is handled by officer Alan Nutzman, was introduced to the community Tuesday night during National Night Out. This is Nutzman’s second K-9 partner. His previous K-9 partner, Charlie, was euthanized Dec. 3 after his veterinarian recommended the procedure when an MRI showed the police dog had cystlike features in his brain that were secondary to seizures or strokes. According to Nutzman, he met Luna in March and she officially joined the department in April. Since that time, the two have been going through basic obedience training and preparing for narcotics training. They will spend four weeks training with Metropolitan Police Department’s K-9 unit to become certified for narcotics detection. The patrol and suspect apprehension training was originally scheduled for October in Utah, but has been delayed because of the academy’s budget issues, he said. Once they start, hopefully in the spring, Nutzman said it should take 12-16 weeks to complete. Then they will work with the California Narcotic Canine Association for full certification. “While they don’t take the place of officers, they make them more effective and efficient,” he said. They provided added eyes and ears on patrol and can detect things such as narcotics that human officers might miss. Nutzman said Luna is very fast and agile. He said she is very intelligent and learns quickly — sometimes too quickly and he has to slow her down for their protection. As they train and play Luna can get overzealous and accidentally nip him. He also said she has a great memory. Although Belgian Malinois and German shepherds are more common as police dogs, Nutzman said Dutch shepherds, and Luna in particular, is smaller than his previous partner and easier to handle. He said Charlie weighed about 100 pounds. Shea said the department has already qualified a second K-9 officer, Armando Salazar, who was a K-9 handler in the Air Force, and they hope to find another dog suitable for joining the department soon. He said the assessment process for K-9s is extensive. Once paired with an officer, training begins. The cost to purchase Luna was donated to the department by someone who wished to remain anonymous, Nutzman and Shea said. Both the new K-9 and mounted unit came to the department with “no impact to our budget or general fund. What more can you ask for?” Shea said. As with all animal officers, Nutzman is responsible for Luna’s daily care. She lives at his home with his family and pets, but he said she doesn’t interact with the other animals.